Today we'll end our little trip around Thai 70's and early 80's luk thung, we'll sure come back to Thailand very soon! Today, let's get back around Suphanburi, where it all started with a sweet tape from the 80's with TAM NAN RAK AMATA by POTCHAMAN PHIMCHAN (Saha Kuang Heng, early 80's). If this time we had only women vocals +/- on the same mood with sweet vocals, this tape is quite different as it's more recent as it incorporates more synth. 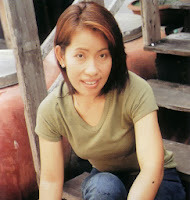 Photchaman Phimchan was born and raised in the northern Nakhon Sawan province, in a farmers familly. After winning several singing contest she's been approched by some good songwritters and did some duets with some well known singers but she did not really seemed to want the fame and prefered a simple life. Photchaman Phimchan focuced a large part of her work on covering songs such as on the tape we got today where she covers wonderfull song from the amazing diva Khwanchit Siprachan «nam ta sao dok kham tai» on track number 4 (sadly that's exactly the moment the tape choosed to have some minor troubles but the it's still really enjoyable). Anyway, let's play that great music and thanks again to Peter and Thani for their precious help!